Joachim Raff was born at Lachen, near Z�rich in Switzerland, in 1822. With the encouragement of first Mendelssohn and later Liszt, he decided upon a career as a composer and teacher. Liszt in fact secured him various appointments in major German cities, before in 1850 Raff moved to Weimar, where he worked directly with Liszt, who had recently become Kapellmeister there. It was around this time that Liszt developed his interest in orchestral music, most particularly realised in his series of symphonic poems, and Raff gave him major assistance in copying parts and in orchestration. This experience proved invaluable, and in 1856 Raff moved to Wiesbaden in order to be able to devote more time to his own creative work. Moreover, for the remainder of his life he was astonishingly prolific, writing music in all the main genres, including for instance no fewer than eleven symphonies.� In 1877 he became director of the Hoch Conservatory in Frankfurt, and he held this post until his death in 1882. Raff's music reflects various stylistic influences, chief among them Mendelssohn and Liszt, not surprisingly. He was concerned to take a position in the historical continuum, fusing together the old with the new, in particular through the contrasts between romantic programme music and the classical tradition. During his lifetime he was regarded alongside Wagner and Brahms as a leading master of modern music, although the judgement of posterity has tended to be somewhat harsher. In the light of all this the appearance on CPO of Volume One in a series of string quartet recordings is most welcome. The project will not cover the topic chronologically, as the contents (Nos. 6 and 7) of this disc readily testify, but there is no reason why it should do so. With the subtitle �Suite in the Old Style�, the C minor Quartet exudes a particular personality. Like its companion in D major, it has a cogency and natural sense of quartet style that communicates directly on first acquaintance. In his somewhat wordy note, Matthias Wiegandt comments that the music represents �indecision between constructive strictness and laissez-faire, so typical of Raff�. This is true, and it is at once the music�s strength and its weakness. For the line of development is always fluent as it is logical. What is less striking is the sheer personality of the ideas themselves. Perhaps this is why this piece is hardly known today. The Quartet No. 7 in D major is a companion piece, released as part of the same opus. Again there is a subtitle, The Fair Maid of the Mill (Die sch�ne M�llerin), with its obvious links to Schubert. But in Raff�s Quartet the link is generalised rather than specific; nor is it any the worse for that. It helps that the first movement opens strongly, at least in this fine performance by the Mannheim Quartet, captured in ambient sound by the talented CPO engineers. Across a sequence of six movements the music charts the progress of the story�s romantic feeling, moving from movement to movement without undue pause and with concern for poetic feeling. Raff was an expert orchestrator and his talents extend to quartet textures also. The playing of the Mannheim Quartet is exemplary and does due credit to all this, with a sensitive response to nuance and phasing; always with convincing interpretations of tempo. 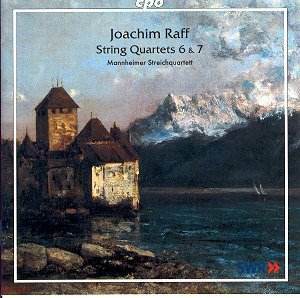 These performances confirm that Raff is a talented and wholly convincing composer of string quartets, able to adapt the principles of the classical inheritance to his own romantic ends. The next volume in the series can be eagerly awaited.